Cattleya orchids (sometimes referred to as Corsage Orchid) are ephytes (or air plants). They prefer warm temperatures and high humidity, and are known for their large, stunning (and sometimes fragrant) flowers. The huge blooms can reach up to eight inches across, and come in a wide range of colors and patterns. Since cattleya orchids are so beautiful and easy to grow, they are one of the most hybridized orchid species - there are thousands of hybrids registered. Most cattleya species produce one new flush of growth during the growing season. New pseudobulbs will typically produce flowers during the same growing season (usually late summer or winter). Some hybrids will bloom twice annually. Flowers will vary by species. 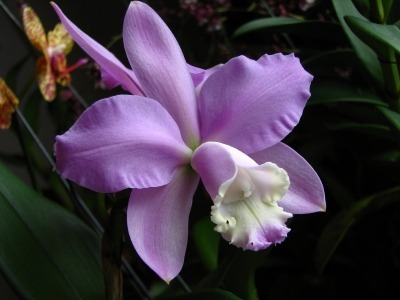 Cattleya orchids may produce just a few showy flowers or bunches of small, wax-like flowers. Cattleya orchids need abundant light, they prefer bright, year-round lighting. Ideally, you should ensure this orchid receives some direct light sunlight during the morning or late afternoon. Dark Green Leaves – Not enough light, which could hinder flower production. Light Yellow-Green Leaves – Too much light. Medium Green Leaves with a Slight Yellow Cast (Apple Green) – This indicates that your orchid is receiving the ideal amount of light. Fifty to eighty percent humidity is ideal for cattleya orchids. This can be provided by placing the orchid pot on a tray of gravel filled with a small amount of water or by placing a humidifier in the room or greenhouse. Late Spring to Early Fall – Feed every two weeks. Winter – During cold months, reduce feeding to monthly. Tip: To prevent and remove excess salts from potting soil, thoroughly flush with clear water every month. Allow soil to become slightly dry between watering. Your orchid will need more water in the summer due to the warmer temperatures (soil will dry quicker). The best time to divide is when the plant has more than seven pseudobulbs. Divide by separating into clumps of three or more. Cover a flat work space with butcher paper or newspaper. To loosen the orchid, tap the pot gently or slide a knife between the soil and the pot. Tilt the orchid pot sideways and gently remove the plant from the pot and lay it on the work surface. Remove as much of the potting mix from the root ball as possible. Break away clumps of old potting medium with your fingers so you can view the roots. Trim off dead or broken roots with a sterilized sharp knife or pruning shears. Remove any older pseudobulbs, leaving at least four pseudobulbs near the new growth. Note: Until a plant has at least six mature pseudobulbs, it should be put into a larger pot and not divided. If dividing a plant, three to five pseudobulbs per division are required. To ensure proper drainage, place 1 in/2.5 cm of pebbles, broken pottery pieces, or other drainage material in the bottom of the orchid pot. Select a pot that will allow for approximately two years of growth before crowding the pot. Hold the orchid in the new pot with one hand so it's at the same depth as in the old pot. Cattleya orchids should be placed toward the back of their pots, not in the center. Gently press potting mixture under and around the root ball. Arrange the roots so the older growth is toward the back of the pot. Push a stake carefully into the potting medium, avoiding touching the roots, and tie the leaves to it with yarn or string for support. Soak the pot in water for 15 minutes to moisten the new medium, and allow it to drain. Keep the plant humid, shaded and dry at the roots until new root growth is seen. Can last many years when propagated by division. This species group is large and varied. Larger species tend to be easier to grow than their miniature counterparts (mini-catts). Flower form, plant size, and fragrance vary greatly. If possible, visit your local nursery or talk to a local orchid specialist for advice on choosing the best orchid. A windowsill in a bright, sunny location.